This post has been sponsored by Hallmark. All thoughts and opinions are my own. Every year, the LMP gals do a little gift exchange amongst ourselves in the office. Since we spend almost every day together, I’d say we know each other pretty well. This makes purchasing gifts for each other a breeze. Seri is the host, Maggie is the DIY queen, Natalie is the baker, and I’m the bartender. So this year we themed our gifts around just t hat: gifts to fit each of our personalities. This is our busiest time of the year. We’ve been working overtime on a variety of events, content, and so much more. That’s why when it came time to put our gift baskets together, it was no surprise that everyone ordered or had their gifts delivered to the office. Right down to the wrapping and card. We found everything we needed to make our gifts look thoughtfully wrapped on Hallmark’s website. Out in the suburbs of New Jersey, Natalie actually has a Hallmark store practically in her backyard, so she went in person to check out their selection of cards and wrapping options. You can find your local Hallmark store by clicking here. She brought back an awesome selection of tissue papers and gift bags. Crafty Maggie of course had the genius idea to use the tissue paper not only to stuff our gift bags but also line our boxes. This transformed the whole look. Instead of plain black boxes, we had festive ones in all sorts of fun patterns. When the morning came to exchange gifts, we started off with a card exchange. It was fun to see all the different holiday cards everyone picked out for each other. Seri picked out a beautiful Nutcracker card for Maggie and the message inside was too perfect. 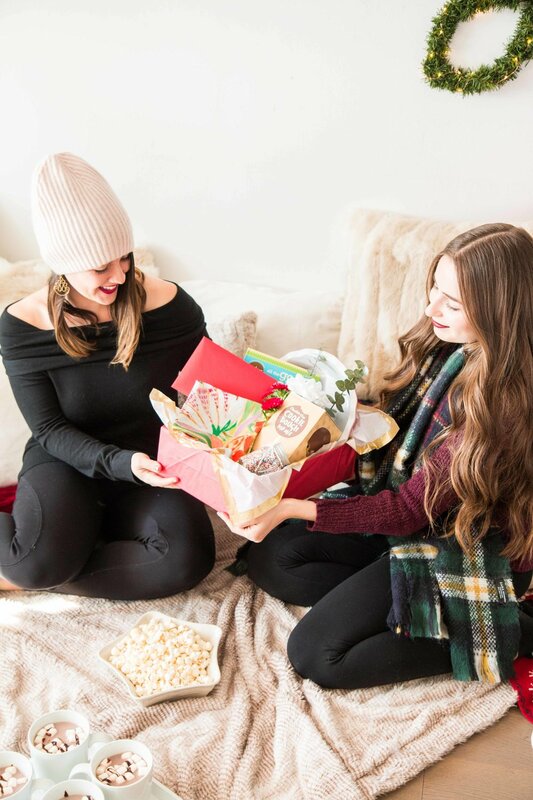 It read, “Wishing you a Christmas filled with all your favorite things.” It was too fitting, seeing as her box was filled with a variety of crafting items, Maggie’s specialty. To Seri, the ultimate hostess, Maggie gifted her an assortment of adorable holiday party goods, (all of which can be found on our online shop here), a disco ball tumbler, a pink letterboard, and a stylish jewelry book. To Natalie, I gifted baking supplies, complete with a cute cookie dough pop mix, a baking pan, sprinkles, and a pretty dish towel. Natalie gifted me the most perfect cocktail kit, with a copper shaker, a cocktail mixing recipe book, wine, and a muddler. Of course we all love our personal gift boxes but now, thanks to Hallmark our cards will be keepsakes for us this year too! 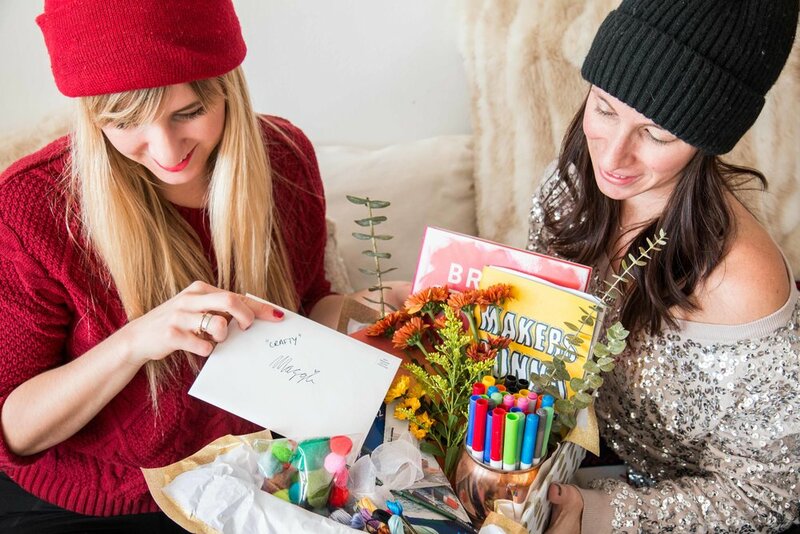 Once we exchanged our thoughtful, personalized gift boxes, we relaxed in our cozy sweaters amongst a bunch of fuzzy blankets and pillows. 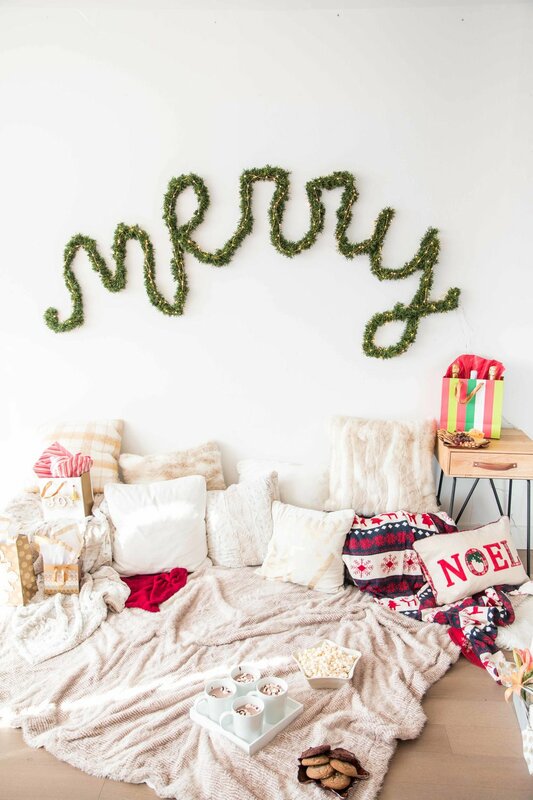 We sipped hot cocoa and munched on popcorn underneath this fabulous “Merry” garland, which Maggie DIY-ed with faux evergreen garland, wire and twinkle lights. 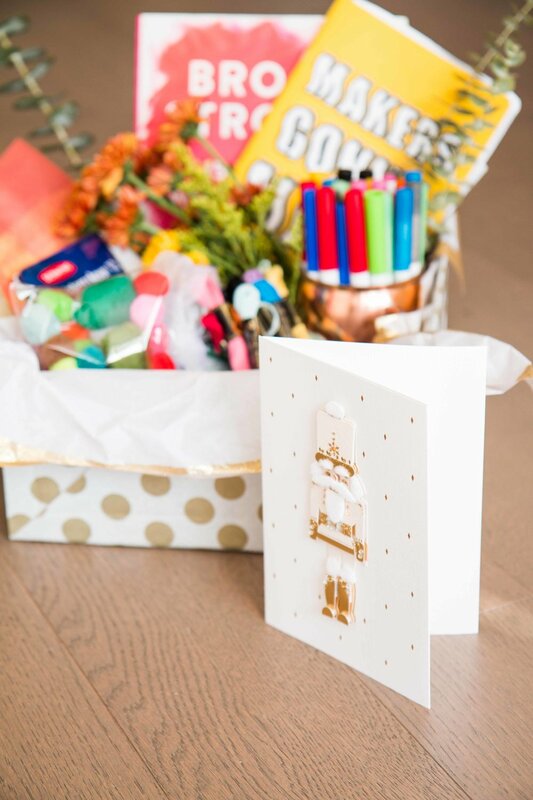 We hope you have as much fun while gifting with Hallmark Signature Cards and Gift Wrap as we did! Happy Holidays.